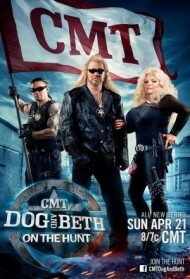 The world's most renowned bounty hunters, Dog and Beth Chapman, return to television in an all-new, 11-episode series, DOG AND BETH: ON THE HUNT. Dog and Beth, joined by their son Leland, will step outside their headquarters in Hawaii to unite with bail bondsmen from around the country as they hunt down some of America's most dangerous criminals. Season 3, Episode 12 - "Old Friends, New Beginnings"
Season 3, Episode 11 - "Catch You on My Way Out of Town"
Season 3, Episode 10 - "The Dark Night Returns"
Season 3, Episode 9 - "The Dark Night"
Season 3, Episode 8 - "The Houston Solution"
Season 3, Episode 7 - "Houston We Have a Problem"
Season 3, Episode 6 - "The United States of Texas"
Season 3, Episode 5 - "Lester's Last Stand"
Season 3, Episode 4 - "Road to Redemption: Part 2"
Season 3, Episode 3 - "Road to Redemption: Part 1"
Season 3, Episode 2 - "Cecily Steps Up"
Season 3, Episode 1 - "Return to the 'Aina"
Season 2, Episode 17 - "Birthday Special: Part 2"
Season 2, Episode 16 - "Birthday Special: Part 1"
Season 2, Episode 15 - "Family Fugitive"
Season 2, Episode 14 - "Rocky Mountain Menace"
Season 2, Episode 13 - "There's Something About Mary Ellen"
Season 2, Episode 12 - "Music City Mayhem"
Season 2, Episode 11 - "Jambalaya Justice"
Season 2, Episode 10 - "Big Easy Bounty"
Season 2, Episode 9 - "Desert Justice"
Season 2, Episode 8 - "Long Arm of the Dog"
Season 2, Episode 7 - "Rude Awakening"
Season 2, Episode 6 - "Love Conquers All"
Season 2, Episode 5 - "Popcorn Bounty"
Season 2, Episode 4 - "Fathers and Sons"
Season 2, Episode 3 - "Rites of Passage"
Season 2, Episode 2 - "Action in Jackson: Part 2"
Season 2, Episode 1 - "Action in Jackson: Part 1"
Season 1, Episode 19 - "Best of Dog and Beth: On The Hunt"
Season 1, Episode 18 - "Trouble at Home"
Season 1, Episode 17 - "Divine Intervention"
Season 1, Episode 16 - "Handcuffed"
Season 1, Episode 15 - "Southern Fried Bounty"
Season 1, Episode 14 - "Big Sky Bounty"
Season 1, Episode 13 - "Rock Bottom Bounty"
Season 1, Episode 12 - "Training Dakota"
Season 1, Episode 11 - "Dog Days of Kansas"
Season 1, Episode 10 - "Paradise Lost"
Season 1, Episode 9 - "Doglahoma 2: For a Few Bounties More"
Season 1, Episode 8 - "Doglahoma: A Fistful of Warrants"
Season 1, Episode 7 - "Viva Dog Vegas"
Season 1, Episode 6 - "Norwalk This Way"
Season 1, Episode 5 - "L.A. Consequential"
Season 1, Episode 4 - "Going to Jackson"
Season 1, Episode 3 - "Family Bonds"
Season 1, Episode 2 - "Big Trouble in Little Clovis"
Season 1, Episode 1 - "Dog's New Tricks"